David Carson (born September 8, 1954) is an American graphic designer, art director and surfer. He is best known for his innovative magazine design, and use of experimental typography. He worked as a sociology teacher and professional surfer in the late 1970s. From 1982 to 1987, Carson worked as a teacher in Torrey Pines High School in San Diego, California. 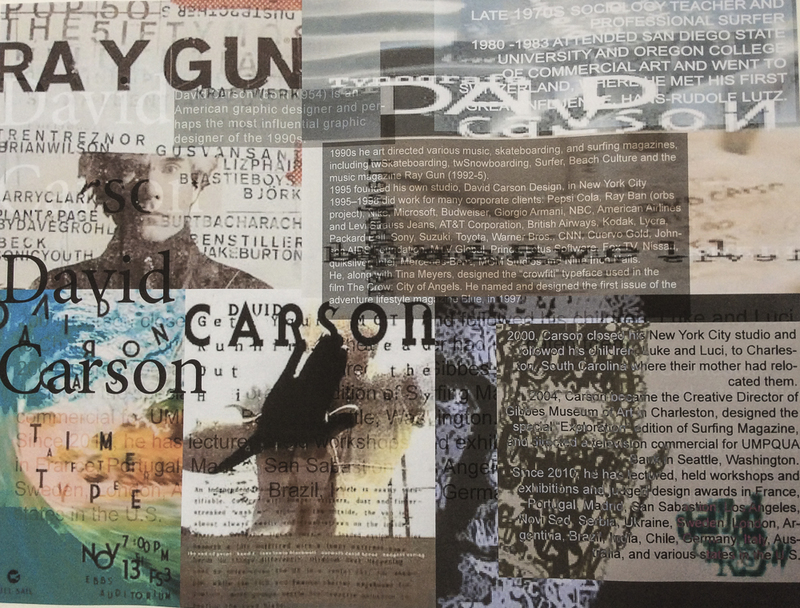 In 1983, Carson started to experiment with graphic design and found himself immersed in the artistic and bohemian culture of Southern California. He art directed various music, skateboarding, and surfing magazines through the 1980/90s, including twSkateboarding, twSnowboarding, Surfer, Beach Culture and the music magazine Ray Gun. By the late 1980s he had developed his signature style, using “dirty” type and non-mainstream photographic techniques. 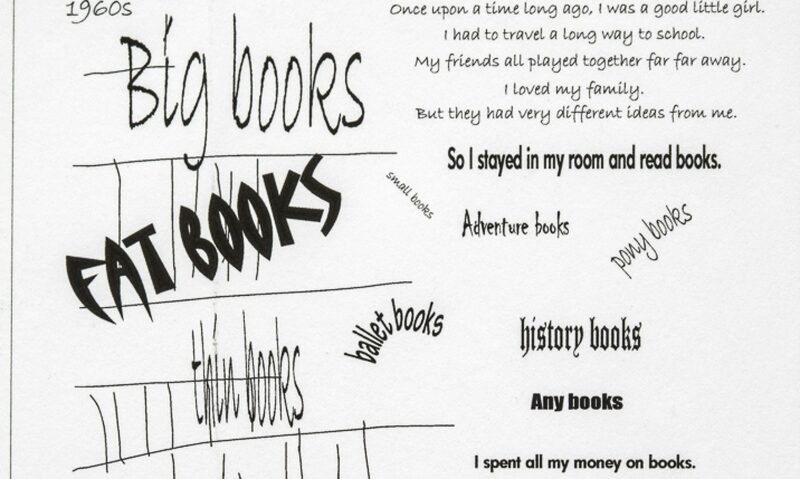 As art director of Ray Gun (1992-5) he employed much of the typographic and layout style for which he is known. In particular, his widely imitated aesthetic defined the so-called “grunge typography” era. In one issue he used Dingbat as the font for what he considered a rather dull interview with Bryan Ferry. In a feature story, NEWSWEEK magazine said he “changed the public face of graphic design”. He takes photography and type and manipulates and twists them together and on some level confusing the message but in reality he was drawing the eyes of the viewer deeper within the composition itself. His layouts feature distortions or mixes of ‘vernacular’ typefaces and fractured imagery, rendering them almost illegible. Indeed, his maxim of the ‘end of print’ questioned the role of type in the emergent age of digital design, following on from California New Wave and coinciding with experiments at the Cranbrook Academy of Art. In the later 1990s he added corporate clients to his list of clients, including Microsoft, Armani, Nike, Levi’s, British Airways, Quiksilver, Sony, Pepsi, Citibank, Yale University, Toyota and many others. When Graphic Design USA Magazine (NYC) listed the “most influential graphic designers of the era” David was listed as one of the all time 5 most influential designers, with Milton Glaser, Paul Rand, Saul Bass and Massimo Vignelli. He named and designed the first issue of the adventure lifestyle magazine Blue, in 1997. David designed the first issue and the first three covers, after which his assistant Christa Smith art directed and designed the magazine until its demise. Carson’s cover design for the first issue was selected as one of the “top 40 magazine covers of all time” by the American Society of Magazine Editors. In 2000, Carson closed his New York City studio and followed his children, Luke and Luci, to Charleston, South Carolina where their mother had relocated them. In 2004, Carson became the Creative Director of Gibbes Museum of Art in Charleston, designed the special “Exploration” edition of Surfing Magazine, and directed a television commercial for UMPQUA Bank in Seattle, Washington. Carson claims that his work is “subjective, personal and very self indulgent”. Carson, David (1995). The End of Print: The Graphic Design of David Carson. Chronicle Books. ISBN 0-8118-1199-9. Carson, David (1997). David Carson: 2nd Sight: Grafik Design After the End of Print. Universe Publishing. ISBN 0-7893-0128-8. Meggs, Phillip B.; David Carson (1999). Fotografiks: An Equilibrium Between Photography and Design Through Graphic Expression That Evolves from Content. Laurence King. ISBN 1-85669-171-3. Stecyk, Craig; David Carson (2002). Surf Culture: The Art History of Surfing. Laguna Art Museum in association with Gingko Press. ISBN 1-58423-113-0. Mcluhan, Marshall; David Carson, Eric McLuhan, Terrance Gordon (2003). The Book of Probes. Gingko Press. ISBN 1-58423-056-8. Carson, David (2004). Trek: David Carson, Recent Werk. Gingko Press. ISBN 1-58423-046-0. Mayne, Thom; David Carson (2005). Ortlos: Architecture of the Networks. Hatje Cantz Publishers. ISBN 3-7757-1652-1.